Great news for office Capex budget planners as Brother offers big deals of discount through their Cash Back Promo! Brother Philippines is awarding shoppers with rebates of up to P1,500 for every purchase of select Brother Refill Tank System multi-function printers with its Cash Back Promo, which will run until end of March 2017. 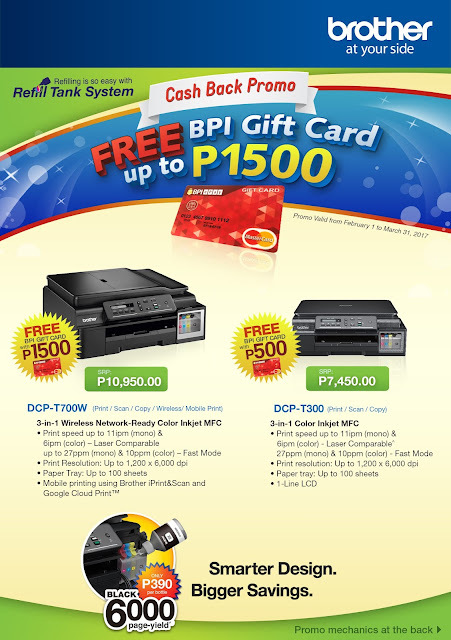 Under the promo, purchases of Brother DCP-T700W 3-in-1 Wireless Network-Ready Color Inkjet Multi-Function Center (MFC) with a suggested retail price (SRP) of P10, 950 entitles the owner to a free BPI gift card with load amounting to P1,500. Whereas each purchase of Brother DCP-T300 3-in-1 Color Inkjet MFC with SRP of P7,450 entitles one to a free BPI gift card worth P500. BPI gift cards can be used at all MasterCard affiliates nationwide. Only purchases made at Brother authorized dealers nationwide are qualified for the promo. “Our Cash Back Promo is our way of encouraging our customers to go for cost-efficient machines that produce quality outputs for their homes and offices. It is also our way of thanking them for trusting Brother with their printing needs, among others,” Brother Philippines President Glenn Hocson said. Brother DCP-T700W allows one to not only print, scan and copy, but also enjoy its wireless and mobile printing capability using Brother Print&Scan and Google Cloud Print. Brother DCP-T300 has the same capabilities, except that it is not network-ready. Both color inkjet multi-function printers boast of print speed capability of up to 11 images per minute (ipm) on black and white and 6 ipm on color, an excellent print resolution of up to 1,200 x 6000 dpi, and the capability to load up to 100 sheets in its paper tray. Both the DCP-T300 and DCP-T700W MFCs are equipped with Brother’s Refill Tank System. Unlike other non-genuine third-party refilling devices, Brother’s easy-to-use Refill Tank System is built right into the machine itself, allowing users to maximize productivity and savings while preventing machine damage. For the detailed promo mechanics and more information on the latest innovations and promotions from Brother Philippines, visit www.brother.com.ph, like Brother Philippines’ Facebook page, follow @brotherphils on Twitter and Instagram, or call (02) 581-9888.